Microwaves give energy to sulfur atoms which emit then emit light. A magnetron generates microwaves that are contained by a wire mesh screen. 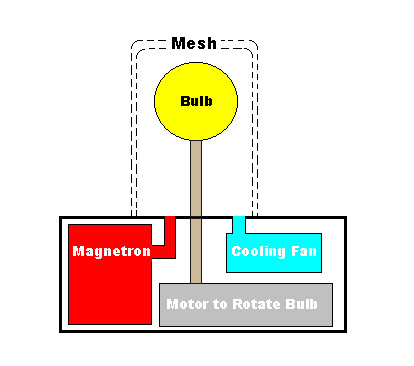 A fan cools the bulb and a motor sppins the bullb rapidly so that temperatures stay uniform over the bulb's surface. There are no electrodes inside the bulb, and since the sulfur is very stable these golf ball-sized bulbs can last a very long time. In fact, in current models of the lamp the magnetron will fail before the bulb will.